The station 21 has 14 fully equipped intensive medical beds, divided into two four-bed rooms and two twin rooms. Furthermore, the Anästhesiologische Intensivstation 39 provides permanent 6 beds for neuro-surgical patients. Patient documentation is implemented via the online documentation system "ICCA". 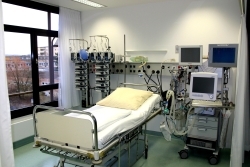 In the 3-shift system, two patients are always cared for by a nursing staff; medical care is provided with one assistant and one surgeon per ward. The nursing team of neuro-surgical intensive care is made up of over 60 nurses. The individual nursing staff of the intensive care unit are highly qualified and have a wide range of advanced and advanced training. The spectrum of existing qualifications extends from specialist care for intensive care and anesthesia, intermediate care, kinaesthetics (certified user), practical guidance to a study of nursing education. Visiting times: Patients' visits from relatives are expressly welcome at this station and are proven to contribute to the success of the therapy. Due to the great intensive medical care that our patients have, we are dependent on fixed visits. These range from 15:30 to 18:30. The entire striving of the interprofessional team of the intensive care unit is designed to keep this time window open for your family visit. We therefore ask you to observe this period, also in the interest of your relative. If you should still have to wait, we would ask you to consider that some patients need us. Information on the phone: The next relatives will of course receive telephone information about the current state of the therapy of the patient. For legal reasons, this must be restricted to selected persons in the family environment. For the interprofessional team it is helpful if you select a permanent contact within the family circle. In order to meet the requirements of modern neurosurgical intensive care, a continuation of continuing education is offered, which is embedded in an overall nursing care frame. One concern of the management team is to integrate and expand the individual competences of the employees. In continuous station meetings, the team-internal development processes are supported and promoted in addition to the discussion and regulation of organizational tasks. 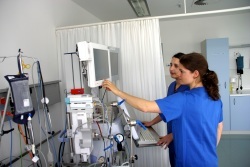 In our nursing team, all employees are trained with a Maietta-Hatch Kinästhetics basic course and / or advanced course. At regular intervals a 6 - hour karaesthetic workshop takes place, which is designed by the 3 certified users. Our aim is to move and mobilize our patients according to kinesthetic aspects in order to support their health development. The medical staff is assisted by neurosurgeon assistants, who are employed in the intensive care unit for six months as part of their specialist training. Close interprofessional networking with the staff from physiotherapy, occupational therapy and speech therapy contributes significantly to the success of therapy. If necessary, the hospital counseling department is involved in the intensive medical treatment and care process of the patient and his / her relatives.